It is important to understand the difference between probate and non-probate assets. 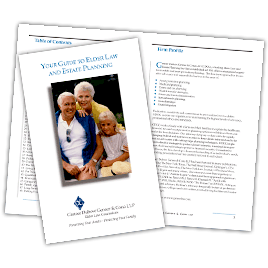 Probate is the legal process overseen by the Surrogate’s Court where a deceased person’s assets are distributed in accordance with their Last Will and Testament, or according to the laws of their state if they did not have a Will. Probate is necessary for those assets that were owned solely in the name of the deceased or if the assets were owned as “tenants in common”, where each owner has a distinct share and interest in the property. Not all assets owned by the deceased at the time of their death will need to go through probate; these are called non-probate assets. Non-probate assets will pass directly to your named beneficiaries. Non-probate assets, or assets that will pass outside of your estate, include accounts payable or transferable on death, accounts held jointly with rights of survivorship, accounts in a living trust (revocable or irrevocable), and accounts with named beneficiaries. It is important that you understand how your assets are held, so that you can make sure that they will pass in accordance with your “testamentary scheme” or how you intend for your assets to be inherited when you pass away. Be aware of jointly held accounts, as they may not end up passing to your intended beneficiaries. For example, if you have an account held jointly with one of your three children, it may be your intent that said account pass equally to all of your children. However, the joint account will pass 100% to the child who is named jointly on the account. The joint account holder has no legal obligation to divide the account with their siblings. It is a good idea to check your beneficiary designations after major life events, such as marriages, divorces, births, and deaths, or even periodically if nothing has changed, as it may be necessary to update your beneficiaries.